Summit Drilling provides environmental consultants and engineering firms with a wide platform of drilling and injection services. From the drilling and installation of monitoring wells that enable subsurface investigation of ground water, to geotechnical soil borings that confirm bedrock in a broad range of geologies, Summit relies most on it’s greatest asset – it’s people. Like many aspects of military operations, it can be very tough work that requires specially trained teams to operate highly technical and sophisticated equipment – in conditions that are often difficult. Success in the field is dependent on many factors. Training, teamwork, real-time situational analysis, communications, safety, equipment and a personal commitment to doing the job right, are all important factors in accomplishing the objective. 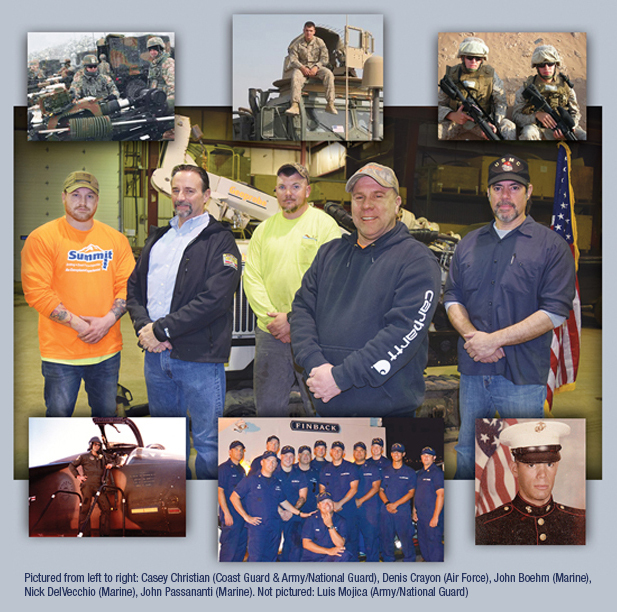 Summit Drilling has always valued the commitment, training, talent and character associated with our country’s military veterans. They currently employ military veterans representing the Marine Corp., Air Force, Coast Guard and Army/National Guard. Continuing it’s support of veterans, Summit is actively participating with a Veterans Transition Assistance organization named Bridging The Gap to add additional talent to their roster. Discipline. First and foremost, this is one of the hardest assets to learn and to develop but indispensable for growing up. Responsibility. Show up on time and be prepared for the day and tasks ahead. Respect. Show respect to superiors and team members. Disrespect was not tolerated. No individual is greater than the team. Training. On-the-job training-to become proficient in my job. Being trained by those who came before me was all-important and showed the need for continuity in any operation. Recognition. Everyone likes to be recognized for a job well done. It can oftentimes provide motivation when money can’t be offered. Accountability. No excuses. You’re trained what to do, how to do it, provided with the tools and equipment to perform, and an expected timeline to complete. Mission. Having a mission provided focus for all involved and brought about camaraderie. Knowing the roles others played toward mission accomplishment was all-important. Bridging the Gap is veteran owned, 503 (c)(3) non-profit that has built a very effective process for helping military vets integrate into a civilian workforce. Their system works in partnership with vet friendly employers and has proven to be more effective than veterans searching through traditional and highly competitive job postings, staffing companies, newspaper ads and job fairs.